Sterling Silver Chain Necklace with Dragon Motif, "Dragon Protection"
Naga the dragon is a mythical being responsible for protecting Earth. 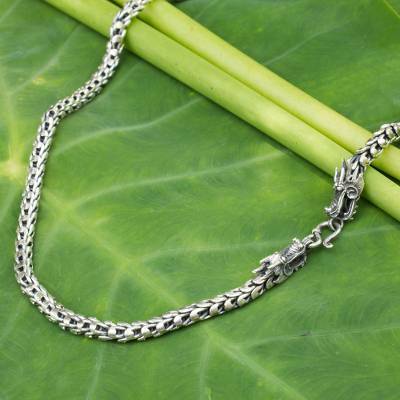 His body is similar to a snake's, which Achara elegantly presents with this sterling silver necklace. Artistry to what is stated by the Artists and Novica! Amazing detail to what should be expected of pride! A hefty piece for a serious person to sport spectacular craftmansmanship to honor traditions abroad! ......a gift to myself, and would purchase again for the intricate aspects of the Artists Craftsmanship! :-) Thank You for an excellent item of crafted heart!